Dylan & Co.: How does your garden grow? 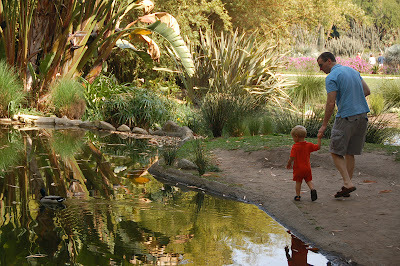 Last weekend we decided to explore the Huntington Gardens. With longer summer days and a love for long walks, Ryan made the executive decision to splurge on a membership so we can return as much as we want. We went both Saturday and Sunday and I took Dylan again this week already, so it seems like we'll be putting it to good use! We explored the gardens over a few hours. We went to the Children's Garden, which is always a hit with Dylan. And explored the beautiful Japanese Gardens complete with a bridge, Koi ponds, and rolling hills. The wisteria is in full bloom, reminding me of the walkway of my parent's house where I grew up. So for this Love Thursday, I'm posting my favorite picture of my boys walking down by the lily ponds. After an hour of sitting in the stroller as we explored the grounds, Dylan needed to get out and stretch his little legs. So he and daddy ran around together while mommy had a turn with the camera! I love the gardens, so beautiful! It's so nice to see the closeness between your husband and son. Oh that last photo is so wonderful! Looks like you had a great time! Thanks for sharing. Happy LT.
That's so sweet. Dylan looks great in that color! That looks like fun! I'm going to have to check that out. LA Toddler would love it, too, but I'm quite sure that if there's water involved that I should probably take at least three changes of clothes. For her and me.